This is all about getting the best start to your day. I always have porridge oats, dried fruit and nuts as well as frozen berries in my kitchen so that I only have to buy the fresh elements to whip up this breakfast. The warm porridge is made sublime by the cold centre of the frozen berries and cream. Put the porridge oats, chia seeds, milled flaxseeds and pumpkin seeds in a saucepan and add half of the milk. Place on a medium heat and bring to a simmer. Cook for 5 minutes, stirring so that it doesn't catch on the bottom. Add the honey and the remaining milk and cook for a few minutes more, still stirring. Add the frozen berries and cover with a lid for 3 minutes. 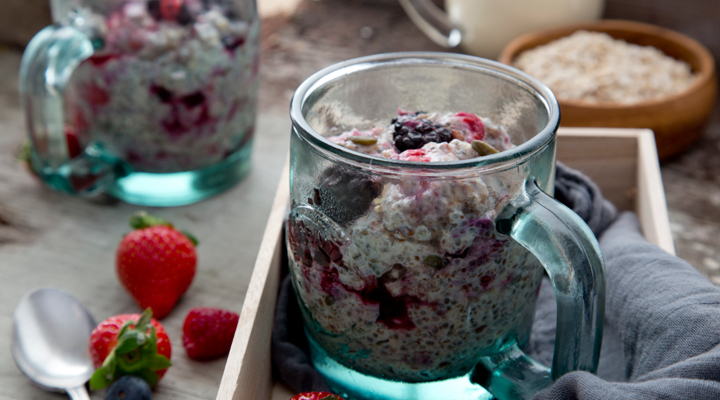 Divide the porridge between two bowls, drizzle over the cream and top with the fresh berries. If you're watching your fat intake, eliminate the cream.